I hope that everyone has taking the necessary steps to prepare for Sandy’s arrival tomorrow night. Already the winds are picking up in many areas and rain is starting to fall. I’m impressed with the flooding that was experienced in coastal NJ with this morning’s high tide. . .which is definitely a bad omen. As of 7 pm EDT, I have seen a gust in South Seaside Park, NJ of 51 mph and near Good Luck Point in Bayville, NJ of 57 mph. Inland, the wind seems to be taking it’s time, but I’m sure no one is ready to welcome it yet. Unfortunately, the three weather stations I deployed with John Wnek of the Marine Academy of Technology and Environmental Science (MATES) have been turned off (don’t get me started) and I think it is to conserve/preserve resources. Hopefully I will get the data from the dataloggers after the fact, but I’m bummed we can’t monitor it live. Sandy is about 400 miles off the East Coast and is still producing these winds well away from its center. In fact, Bermuda is in the tropical storm force winds, which would make this the first time anyone could remember a storm affecting Bermuda and the East Coast at the same time! Talk about setting a precedent! Winds are still kept at 75 mph and the central pressure has been consistent around 952 mb. That pressure could fall starting tomorrow which would mean a landfall tropical, hybrid storm that will most likely have the chance of setting a new standard for East Coast storms. 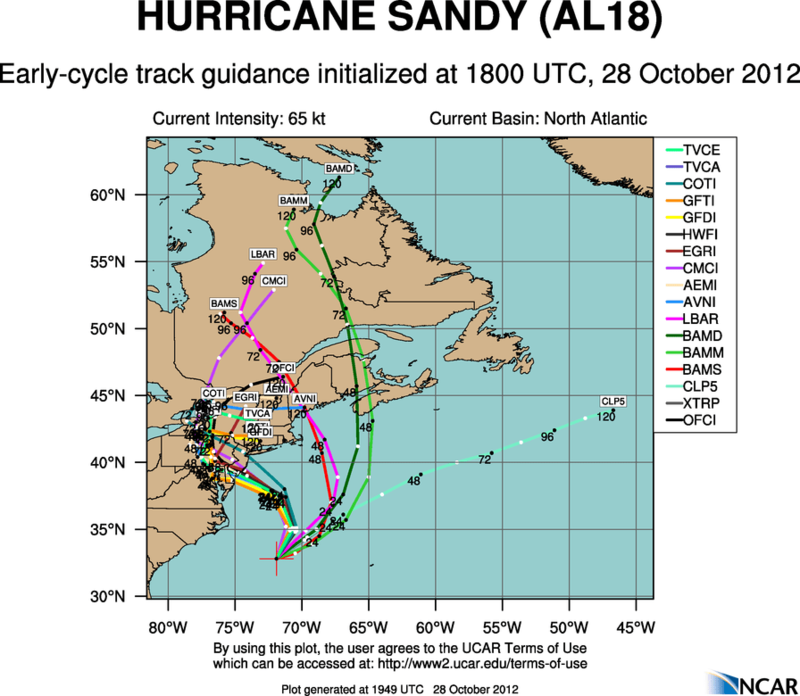 Computer models have routinely had Sandy hitting somewhere between Sandy Hook, NJ to about Rehoboth Beach, DE. If I were to take my best shot, I think the landfall is very close to the NHC ideas of Cape May, NJ. This means the entire Jersey Shore is at risk of seeing northeast to east winds that will increase to 60-70 mph with gusts that could exceed 80 or 90 mph! The coast flood threat has started and will most likely get worse, to the tune of 4 to 8 feet, possibly higher. Rainfall will be to the tune of 3 to 6 inches. Imagine the snowfall if it was Winter! The 18z track guidance above looks very clustered on DE or far southern NJ. The official NHC forecast for Sandy is in the same general area, but Sandy may not be purely tropical at that time, hence the reason there is no hurricane warning this far north. Does it matter? Despite my opinion, no. . .it’s going to be bad for many hours regardless of classification. The DC/Baltimore area will see similar conditions as described above, but tempered somewhat. The rainfall will average 6 to 8 inches, possibly exceeding 10″ in spots. The winds are currently gusting to 25 mph locally, but that will start to increase overnight with gusts exceeding 40 mph likely by daybreak. During the height of the storm, I expect sustained winds of 40-50 mph with gusts that could exceed 80 mph! This could do much damage to trees and power lines, so be aware. The winds will start out north an will actually becoming southerly on Tuesday from DC to NJ! Not your typical storm for sure. Suomi NPP VIIRS day-night band and infrared image (click to animate) showing Hurricane Sandy last night. In time for Halloween, I thought I would show you some “eye-candy” with this very high resolution (1 km day-night band and 375 m infrared band) imagery of Sandy from last night. This satellite will help forecasters learn about the minute details associated with hurricanes and strong coast storms for years to come. Please stay safe and I’ll try to have an update in the morning.